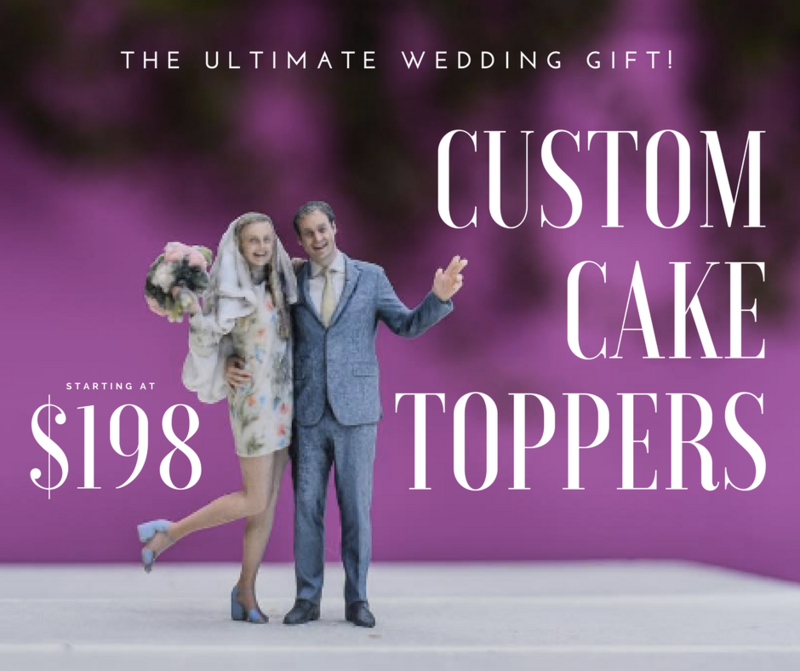 We’ve got your custom cake topper covered! Give them the gift of choice with a Selftraits gift card. *All costs are per person. 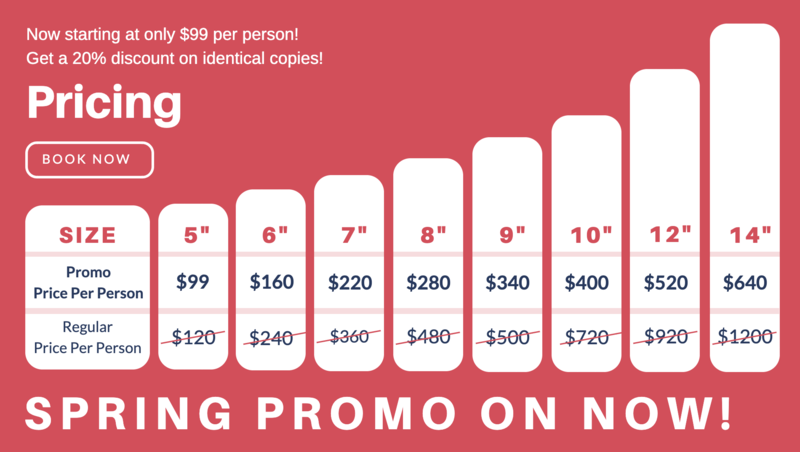 If you would like to purchase Selftraits for 2 or more people, please apply the necessary quantity to associated $ product value. *These prices do not include prop charges. All additional costs will be processed on the day of the shoot. Sign up for our mailing list below and be among the first to receive notifications for exclusive discounts and events! Get a quote for your team or office. WANT TO BRING IN THE WHOLE FAM? INQUIRE WITHIN FOR GROUP RATES! 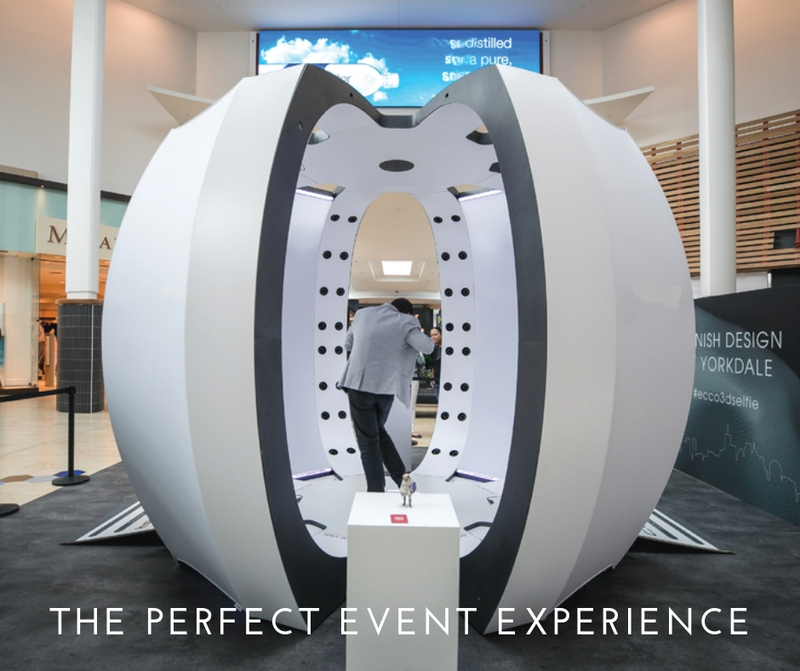 COME PREPARED WITH YOUR BEST SMILE AND POSE(S) FOR AN EXPERIENCE LIKE NO OTHER. STOP BY OUR 3D SCANNING STUDIO IN TORONTO FOR A QUICK SCAN; YOU CAN BE IN AND OUT IN UNDER 20 MINUTES. CHOOSE YOUR FAVOURITE 3D POSE(S) ON SCREEN. WE’LL GIVE YOU A CHOICE OF THREE. NOW IT’S OUR TURN. EACH MODEL IS DIGITALLY ENHANCED THROUGH OUR EXPERIENCED TEAM OF ARTISANS. IN ABOUT A WEEK YOUR MODEL WILL BE 3D PRINTED AND READY TO SHOW OFF TO YOUR FRIENDS AND FAMILY! CHOOSE TO PICK-UP YOUR MODEL AT OUR STUDIO OR HAVE SHIPPED DIRECTLY TO YOUR DOORSTEP. Selftraits launched in July of 2015 with one goal in mind: to immerse the general public into the world of 3D printing. Since our launch, we have had the pleasure of scanning and printing thousands of people of all different ages and backgrounds. Whether it’s a cake topper, family portrait or you in your favourite shirt, we provide our customers with a keepsake and experience like no other! Part of the secret to capturing not only dynamic poses but also personality lies in the Selftraits 3D photo booth. Built in house and outfitted with 140 DSLR cameras, the unit grabs images from that many angles instantaneously. Images are digitally stitched together to get a 3D rendering, which is tidied up by digital artists and sent to a 3D printer. After finishing, the model is ready for pick up or shipping. True art can become a very expensive and time-consuming process. With that said, we wanted to ensure the love of our technology could still be shared with the world – through a fun and cost-effective means. Through the Projex Selfie initiative, our aim is to ensure the general public has adequate access to capturing their most cherished moments within an affordable budget and timeline. From this – Selftraits was born: we have now opened our studio doors and state-of-the-art technology to those who matter most, our community and supporters. We believe that allowing an equal opportunity to experience this technology will enable a larger reach and help to expand the capabilities of our technology moving forward. More importantly, we believe in the development of this project as charity based campaigns with focus on giving back. Through our Projex Selfie ambassador program we are establishing a large-scale influencer and donors initiative to help drive traffic and funding to their desired organizations. SEE WHERE SELFTRAITS IS MAKING HEADLINES! Find out more on our Press Page.